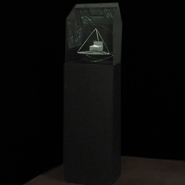 A video projection shines upward from inside a pedestal/box, dividing and multiplying onto a sculpture of transculent surfaces and forms. These nested forms come from an early drawing by the astronomer Kepler depicting the shape of the universe as polyhedrons and spheres embedded one within the other. But in my version, the shapes give way to a looser rendering as the outer cube sprouts a roof and the central object is a bed. 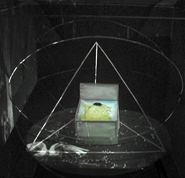 The single video projection from below intercepts these variously transparent shapes and objects and fractures into several layers. Like divided attention, the single beam multiplies from one to many, as it alights on the different objects and surfaces, as well as the ceiling. In this video a small sleeper stirs in bed while a conjured world floats by and around the sleeper. A universe in flux plays against the geometry of the sculpture as stars erupt, birds murmur, grass waves, smoke and snow flood, scatter and pass by. Meanwhile mathematical formulae and diagrams appear suggesting dreamlike explanations or the beginnings of mental and natural ordering. It is the flux of life coming into being in our minds and perhaps outside, forming a sort of cosmogony. It is also the depiction of a single beam of light becoming many. The 16th century Kepler drawing of nested perfect shapes,was driven by a Platonic ideal. Kepler’s model was extraordinary in its mathematical precision, but it soon proved to be more of an imaginative construct than an empirical mapping of the universe. Perhaps with time, most models of the world start to reveal how much each “discovery” speaks to interior constructs rather than the outside world.